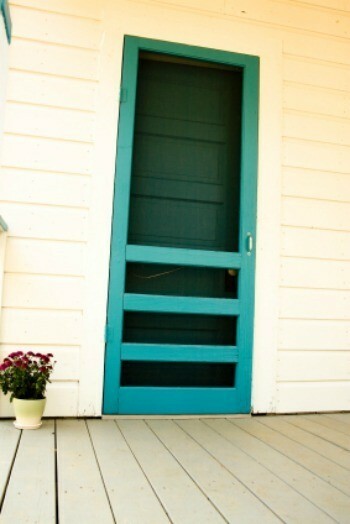 Your screen door is essential for keeping out pesky insects and allowing cool breezes to flow into your home. This is a guide about repairing a screen door. I have a screen door, but the screws holding the closer keep pulling out from the aluminum post because it's hollow. I tried larger screws but they eventually pulled out also. How do I fix it? I think my husband uses JBWeld for this. Have you tried that 2 part epoxy putty? They sell it at Home Depot, as well as auto part stores but Big Lots has it for half the price. You may have seen an infomercial on TV for a brand of it. * I think it's the same thing as JB weld? I use golf tee's and wood glue. Put glue on the sharp end, insert into the hole till it stops. Let the glue set up, then cut the tee off at the frame. Set the door and rescrew the hinge. Drill a hole all the way through the door where the screw(s) tore out. Choose a bit the same size as the hole(s) in the closer bracket. Buy a machine screw slightly smaller diameter than the hole and the proper length to reach through the door with room left over for a nut. I was a carpenter for 50 years. I have found that about 99 out of 100 people will never ever notice your closer is different than any other. If the hinge screws tear out you have a major problem! The screen on my front porch door is tearing where it is attached to the door frame, how can that be fixed? Most screens are held in place by a rubber type"cord". Pull it out and screen is cheap. Just buy a piece bigger than the hole and replace the cord with a pizza cutter or dull knife. Then cut off the excess screen. What is the best way to either replace a broken plastic screen door handle or glue it back together? What is the best glue?